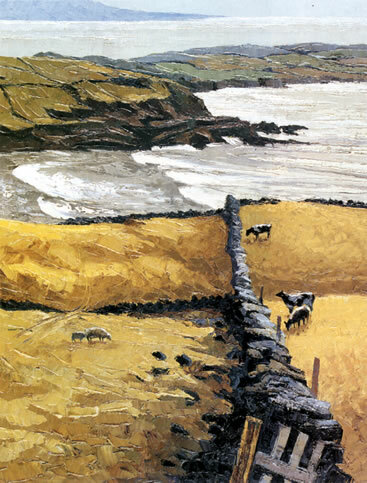 County Donegal - Above Treloar BayAlan Cotton's evocative, powerfully expressed landscapes belong to the great tradition of English romantic painting. They are works inspired by significant places and specific moments in time; paintings that reflect an experience that "touches at the deepest level". Invariably the appeal of his subjects is heightened by the skill with which he interprets a particular kind of light, though equally fascinating is the way that he is able to integrate subject matter, medium and technique to create paintings of real impact and integrity. A distinctive feature of Alan's work is his interest in the physical quality of paint: how textures and marks can both infer meaning and add energy and life to the canvas. "What I most enjoy about landscape painting is the challenge of contrasting locations," he explains. 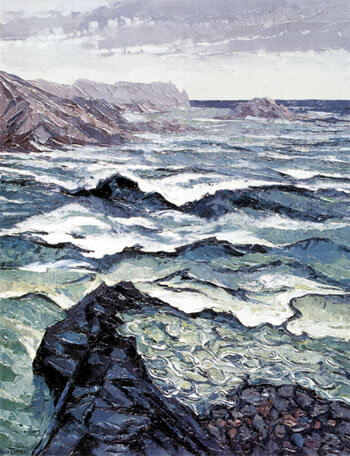 "For example, I am currently working on a series of paintings inspired by the dramatic coastline around Hartland Point, in north Devon. Here, of course, the light and mood are quite different to that of, say, Piemonte in Italy, which is also one of my favourite locations. 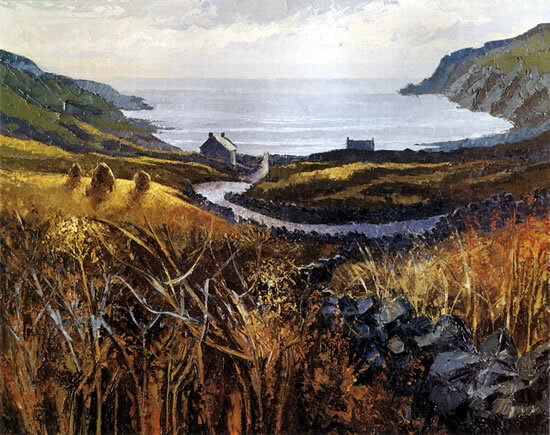 "Hartland has a special place in my affections because it was one of the areas where I first painted. I have always been interested in the way that the cliffs form a kind of barrier that the sea is continually trying to erode and undermine, so there is a constant drama at the cliff edge determined by the mood of the sea, which can be violent or, at the other extreme, quite benign. "In my view it is very important to get to know the landscape before you start painting it. 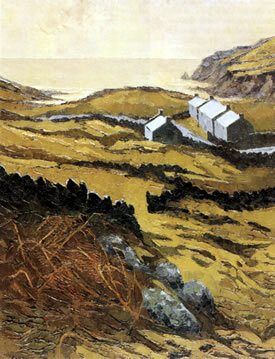 Take, for instance, the west coast of Ireland, where I now often paint in County Kerry and County Donegal. I visited those areas for many years before I felt able to paint there. As at other locations, I needed to learn something about the history of the area and the way the landscape shapes people's lives. Obviously, painting is essentially driven by visual concerns, but I believe it is necessary to probe deeper than that if the work is to be truly rewarding and successful. "That is my preferred approach. However, sometimes circumstances demand a more immediate response to potential subjects and ideas. For example, when I travelled as tour artist with HRH Prince of Wales on his trip to Sri Lanka, Australia, New Zealand and Fiji in 2005, I had to work feverishly whenever there were subjects and opportunities, as we were always moving from place to place. In fact, the highlight of this trip was a visit to the colony of royal albatrosses at Taiaroa Bay, on South Island, New Zealand. I worked there for a couple of days and subsequently made a series of paintings featuring the spectacular coastline and these huge, graceful birds gliding around the headlands. "Travel is a vital part of my working process: it provides the means to discover fresh subjects and so keep my paintings lively and interesting. I always know when a period of work is coming to an end, because I start feeling distraught and needing a break. After a break I pick up again, and this is what has happened with the Hartland paintings. I was unsure about returning there, but it has proved totally inspiring. Variety is a good thing, I think, and I am always willing to try new ideas and adapt my technique accordingly. County Donegal - Cottages at Kilcar"Now, when travelling, I take far less equipment with me than I used to. In contrast to the romantic notion I had when I was a student, when I would encumber myself with easel, paints and all kinds of materials, experience has taught me that it is what happens in the mind that counts most. So I usually restrict my equipment to sketchbooks, pens, pencils and watercolours. "I make a lot of drawings and I also rely on my memory and imagination. It is surprising how many drawings you can make in a day, and these will provide the reference and framework for what happens in the studio. "Photographs are sometimes helpful for additional reference, but there is a danger in relying too much on this sort of information. Drawing encourages looking and experiencing. A drawing will remind you of the sun on your back and the sense of place: a photograph is never as meaningful." 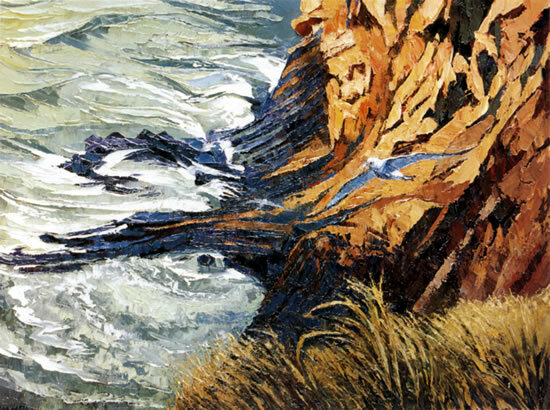 Hartland - Silver LightAlan has always valued the textural potential of oil paint. Early in his career one of the factors that most influenced him to use rich, thick paint was a visit from the art critic John Berger, who much encouraged this approach. From impasto work with a brush he started to introduce areas of colour applied with a painting knife, and gradually this was a technique he developed. Now, apart from some initial drawing and colour- wash work with a brush, he paints entirely with painting knives. "Knives are just as sensitive and versatile as brushes," he says. "You can build up tremendous impasto effects or, as in some of my paintings of Morocco, scrape back to the canvas to achieve much more subtle results. By exploiting the flexibility of painting knives, their different sizes, the amount of paint used and the way it is handled, you can create an immense range of different marks and surface textures. "Paint is a very sensuous kind of material, and I have always admired those painters such as Van Gogh, Nicholas de Stael and Kyffin Williams who have celebrated its physical quality." Alan paints on stretched, heavy-quality cotton duck canvas which is prepared with two coats of glue size and two coats of gesso. Sometimes the canvas is further prepared with a ground colour - often a weak mix of red/brown - to create a mid-tone to work from. However, he usually begins with a white canvas and, after drawing with a brush, he then covers the whole surface with a transparent colour wash. His paints are Daler-Rowney Georgian oil colours, which he buys in large, 225ml tubes. Because Alan works almost exclusively with painting knives, he likes the paint to be "as dense as it comes", and consequently mixes it straight from the tube, without the addition of any mediums or diluents. He does not paint from a set range of colours: the choice depends on the subject matter. Each painting has its own colour key and essentially the selection of colours evolves in a largely intuitive manner, determined by developments on the Canvas. His palette is a sheet of hardboard that is cut to fit the top of an old table. This 'palette' is an ideal size, allowing him sufficient space to spread, mix and experiment with colours in the way that he likes. When, eventually, the hardboard becomes so saturated with paint that it is difficult to mix colours properly, Alan swaps it for a new sheet. 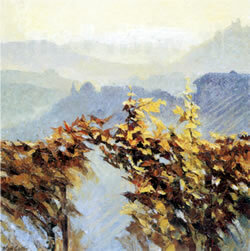 Piemonte - Hazy Hills Beyond the VineyardsThe reference for each studio painting is usually one or more of the drawings made on location, and Alan combines this with his own memories and recollections of the subject. There is no need for any further drawings. As he explains: "Of course, you need to do your homework, but when you paint an essential requirement is the freedom to invent. It is amazing what you can discover during the painting process. Inevitably, if you start a painting having already solved all the problems concerning the composition and so on, it will become deadly dull. "I often play around with the horizon, for example. I think the movements of paint add vigour and expression to the work. From the underpainting and the basic mid-tone ground, I start to build up effects with the painting knives. Generally I start at the furthest point. 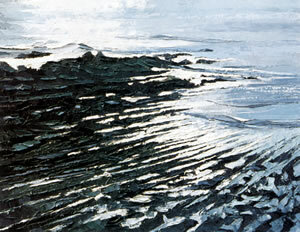 One of the main concerns with landscape subjects is creating a convincing feeling of spatial depth across the painting, from foreground to distance. Here, the scale of the marks, the degree of impasto and the colour relationships are all important contributory factors. Theoretically, in the distance the marks will be shallower and the colours low-key, but in fact I am trying to break away from this device and work with broader strokes right across the picture surface. "The character of each mark is largely determined by the amount of pressure applied to the particular knife, together with the amount of paint used. So the flat part of the knife will give broad sweeps of colour, and the sharp edge is useful for adding precise lines; you can work with large blocks of colour or, contrastingly, delicate marks. Paint can also be dragged or stumbled across the surface - there are many different techniques. "Essentially the marks are metaphors for different features within the landscape - the buildings, trees and so on - while the overall aim is to capture the moment and sense of place. For me, a successful painting is one that brings back my feelings and memories of the subject." "Paint with a Sensuous Impact"